External adjustment to internal orifices (internal pressure). As simple as using an Allen wrench. Ability to monitor the internal pressure and temperature. Features a quick disconnect test port to check internal pressure. Monitoring the internal pressure will confirm the dampers are performing to their capacity. The temperature monitor minimizes over heating the hydraulic oil. W-Tech uses off the shelf seals and components. A basic W-Tech Damper is constructed to last indefinitely, only seals and orifices should wear. Using off the shelf seals and components limits maintenance cost as well as down time. A safety pressure relief system. W-tech Dampers are designed to ensure the dampers cannot be over pressurized. 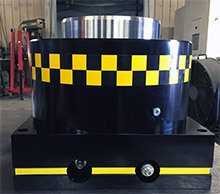 W-Tech Dampers will work in hydraulic and mechanical presses. They are easily retrofittable and mobile. No more difficult to set up than setting up the tooling. This presentation outlines the key features and benefits of hydraulic shock dampers. For anyone who is blanking, punching or die trimming this presentation is worth reviewing. Remember, every press will undergo wear and tear so it is important to learn about preventative tools that can maximize your investments. Please begin reviewing the presentation on these advantages by clicking the arrows below.